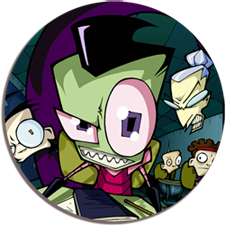 invader zim was created for nickelodeon by comic artist, jhonen vasquez. i was asked to develop the property from bible stage, to then produce and direct the pilot in anticipation of a series. 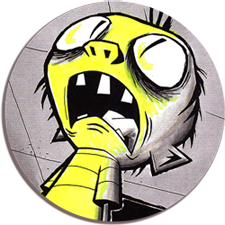 it required the tough job of translating jhonen's very personal and independent graphic comic work into animation. the final pilot was met with a bunch of challenges: stylistically, production-wise and assimilation to nickleodeon's canon. toughest hurdle?...the pilot's relation to then current events: we shipped a show featuring kids in black trench coats, firing weapons in school the week before the tragedy in Columbine, Colorado. Solutions were found, the pilot turned out great and we eventually earned higher focus test scores than any Nick pilot to date. i was awarded the ANNECY FILM FESTIVAL award for best television pilot that year.